نظریات زیادی در ادبیات اقتصادی به تبیین اثرگذاری تورم بر رشد اقتصادی پرداخته‌اند. این نظریات بسته به شرایط اقتصاد جهانی، دیدگاه‌های متفاوتی درباره نحوه اثرگذاری تورم بر رشد اقتصادی مطرح کرده‌اند. از این رو، شناخت چگونگی رابطه بین تورم و رشد در هر اقتصادی مستلزم انجام مطالعات تجربی بوده که ایران نیز از این امر مستثنی نمی‌باشد. لذا در این مطالعه با تاکید بر اثرگذاری غیرخطی تورم بر رشد اقتصادی، فرضیه «اثرگذاری نامتقارن تورم بر رشد اقتصادی ایران» طی دوره 1369:2-1387:2، با استفاده از مدل رگرسیون انتقال ملایم (STR)، مورد بررسی قرار گرفته است. نتایج این مطالعه ضمن تأیید فرضیه تحقیق مبنی بر «اثرگذاری نامتقارن تورم بر رشد اقتصادی ایران» نشان می‌دهد تورم طی دوره مورد مطالعه در قالب یک ساختار دو رژیمی بر رشد اقتصادی ایران تأثیر گذاشته است. 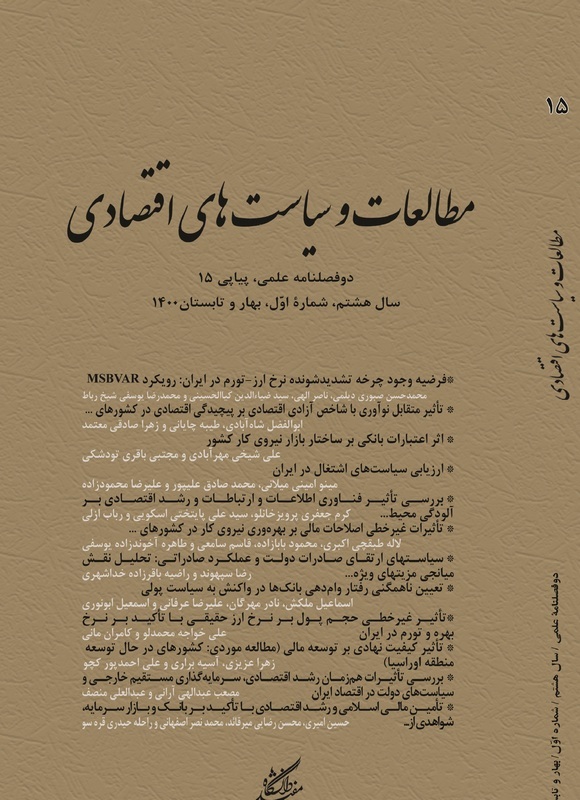 در ضمن نتایج نشان می‌دهد تورم در رژیم اول (دوره‌هایی با نرخ تورم کمتر از 56/4 درصد) اثر مثبت و در رژیم دوم، نرخ تورم‌های بالای 56/4 درصد، اثر خنثی بر رشد اقتصادی داشته است. علاوه بر این نتایج نشان می‌دهد که متغیرهای تشکیل سرمایه و مخارج مصرفی دولت، می‌تواند با توجه به سطح تورم آثار متفاوت بر رشد اقتصادی داشته باشد. This paper examines the asymmetric effect of inflation on the economic growth in Iran during the period 1990:2 – 2008:2. To that end, we use a smooth transition regression model which allows having a regime change in the relationship between the variables. We found evidence of threshold behavior in the relationship between the inflation rate and the economic growth in Iran; such that, there is a threshold level of inflation which beyond that the relationship between these variables changes. This estimated threshold for the quarterly inflation rate is 4.56. The results also show that there is a positive contemporaneous relationship between the inflation rate and the economic growth in the first regime, where the inflation rate is below 4.56; however, for the periods with an inflation rate higher than 4.56 there is not any significant relationship between the inflation rate and the economic growth. In addition, the effects of the government expenditures and investment are regime-dependent and change over the time. اندرس، والتر؛ اقتصاد‌سنجی سری­های زمانی با رویکرد کاربردی، ترجمه مهدی صادقی و سعید شوال‌پور، انتشارات دانشگاه امام صادق(ع)، تهران، 1386. خلیلیان، صادق؛ سام دلیری، احمد؛ حاجیان، محمد مهدی؛ تجزیه و تحلیل رشد و تورم و بررسی رابطه علیت آن­ها در بخش کشاورزی ایران، اقتصاد کشاورزی و توسعه، 1385، شماره 56. جعفری‌صمیمی، احمد؛ قلی‌زاده کناری، صدیقه؛ «بررسی رابطه تورم و رشد اقتصادی در کشورهای در حال توسعه: شواهدی جدید»، نامه اقتصادی، 1386، شماره 63. دادگر، یدالله؛ صالحی رزوه، مسعود؛ «کاربرد مدل (بارو) جهت ارزیابی رابطه بین تورم و رشد اقتصادی در ایران»، فصل­نامه پژوهش­نامه بازرگانی، 1383، شماره 33. دادگر، یدالله؛ کشاورزحداد، غلام‌رضا؛ تیاترج، علی؛ «تبیین رابطه تورم و رشد اقتصادی در ایران»، جستارهای اقتصادی، 1385، شماره 3. Apergis, N; (2004),"Inflation, Output Growth, Volatility and Causality: Evidence from Panel Data and the G7 Countries", Economics Letters, 83 (2), PP. 185–191. Erbaykal, E. and Okuyan, H. A; (2008),"Does Inflation Depress Economic Growth? Evidence from Turkey", Journal of Finance and Economics, 17, PP. 40-49. Espinoza, R. , Leon, H. and Prasad, A; (2010), "Estimating The Inflation–Growth Nexus-A Smooth Transition Model", IMF Working Paper, www.imf.org/external /pubs/ft/wp /2010/wp1076.pdf. Fountas, S. and Karanasos, M; (2007), "Inflation, Output Growth, and Nominal and Real Uncertainty: Empirical Evidence for the G7", Journal of International Money and Finance, 26 (2), PP. 229-250. Gokal, V. and Hanif, S; (2004), "Relationship between Inflation and Economic Growth", Working Paper, www.reservebank.gov.fj/docs/2004_04_wp.pdf . Hineline, D. R; (2007), "Examining the Robustness of the Inflation and Growth Relationship", Southern Economic Journal, 73(4), PP. 1020-1037. Hodge, D; (2006), "Inflation and Growth in South Africa", Cambridge Journal of Economics, 30, PP.163-180. Li, M; (2006), "Inflation and Economic Growth: Threshold Effects and Transmission Mechanisms", University of Alberta, Working papers, Error! Hyperlink reference not valid. Lin, C-F.J. and Terasvirta,T. (1994), "Testing the Constancy of Regression Parameters Against Continuous Structural Change", Journal of Econometrics, 62, PP. 211-228. Mallick, H; (2008), "Inflation and Growth Dynamics: the Indian Experience", Journal of Economic Policy Reform, 11(3), PP. 163-172. Mubarik, Y. A; (2005), "Inflation and Growth: An Estimate of the Threshold Level of Inflation in Pakistan", State Bank of Pakistan - Research Bulletin, 1(1-2), PP. 35-44. Munir, Q., Mansur, K. and Furuoka, F; (2009),"Inflation and Economic Growthin Malaysia", ASEAN Economic Bulletin, 26(2), PP. 180-93. Ng, S., and P. Perron; (1995), "Unit Root Tests in ARMAModels with Data-Dependent Methods for the Selection of the Truncation Lag", Journal of the American Statistical Association, 90, PP. 268-281. Omay, T. and Kan, E. O; (2010),"Re-examining the Threshold Effects in the Inflation–Growth Nexus with Cross-Sectionally Dependent Non-Linear Panel: Evidence from Six Industrialized Economies",Economic Modelling, 27(5), PP. 996-1005. Pollin, R. And Zhu, A; (2006),"Inflation and Economic Growth: a Cross-Country Nonlinear Analysis", Journal of Post Keynesian Economics, 28(4), PP. 593-614. Rodriguez, G. and Sloboda, M. J; (2005),"Modelling Nonlinearities and Asymmetries in Quarterly Revenues of the US Telecommunications Industry",Structural Change and Economic Dynamics, 16(1), PP. 137-158. Terasvirta, T; (2004),"Smooth Transition Regression Modelling, in H. Lutkepohl and M. Kratzig (eds); Applied Time Series Econometrics", Cambridge University Press, Cambridge, 17. Van Dijk, D; (1999),"Smooth Transition Models: Extensions and Outlier Robust Inference", PhD Thesis, Erasmus University Rotterdam. Van Dijk, D., Trasvirta, T. & Franses, P. H; (2000),"Smooth Transition Autoregressive Models-a Survey of Recent Developments",Econometric Reviews, Vol. 21, PP. 1-47.